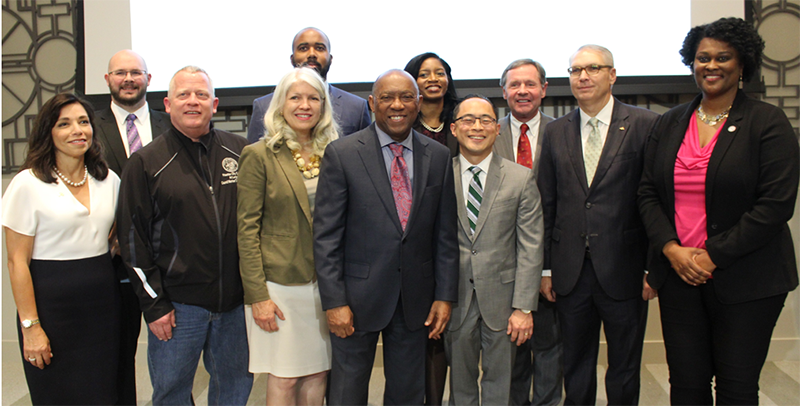 March 26, 2019 -- Mayor Sylvester Turner today accelerated the progress of his Complete Communities initiative by announcing the establishment of a fund to receive private donations and pledges for neighborhood improvements with an initial $25 million fundraising goal. 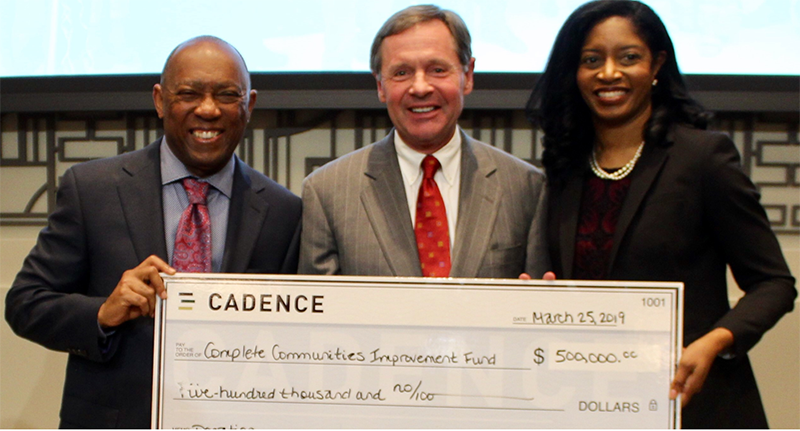 The Complete Communities Improvement Fund already has $10 million in contributions and commitments, including a $500,000 donation from Cadence Bank announced today. “We are pleased to be part of this organization. Its plans are thoughtful and detailed, and we salute Mayor Turner for his leadership,” said Paul Murphy, Jr., Cadence’s chairman and CEO. Started by the mayor in April 2017, Complete Communities is a public-private collaboration leveraging government, non-profit and private sector funds to develop under-resourced neighborhoods with the guidance of their residents. More than 3,500 residents participated in 14 community engagement meetings after Hurricane Harvey to develop Community Actions Plans for the five (5) pilot communities of Acres Homes, Gulfton, Near Northside, Second Ward and Third Ward. Mayor Turner said he will soon announce the next four neighborhoods to come under the Complete Communities initiative. The initiative focuses on increasing mixed-income housing stock, providing micro-lending and mortgage down-payment assistance, teaching job skills, awarding college scholarships, and growing retail and other forms of economic development. Residents identified 371 improvement projects and programs in the five pilot neighborhoods and collaborated with city planners to prioritize the work to be done. The fund was started to identify and secure public and private resources to implement the residents’ action plans. It will be administered by the Greater Houston Community Foundation and guided by an advisory board appointed by Mayor Turner. In the photo above, from left, are advisory board member Laura Jaramillo of Wells Fargo; Harris County Treasurer Dylan Osborne; council members David Robinson and Karla Cisneros; advisory board member Raamel Mitchell of Microsoft; Mayor Turner; Complete Communities Director Shannon Buggs; advisory board member David Kim of the Urban Land Institute; advisory board member Murphy of Cadence Bank; advisory board member Jacobs of Regions Bank; and Council Member Martha Castex-Tatum. Additional fund donors include Wells Fargo, AT&T, United Arab Emirates, Houston Endowment, Comcast, Jack and Jill of America Foundation, and Cities for Financial Empowerment. Down-payment assistance and home-buying education events hosted separately by Wells Fargo and the Neighborhood Assistance Corporation of America. The debut of the Gulfton Story Trail Mural Project, a showcase for 12 murals that celebrate the diversity of culture and food of the area. The Houston Building Institute Acres Home Training Program, thanks to a grant from the global manufacturing company Norbord. Young men and women ages 18- 24 years old completed 12 weeks of training to start their careers in the construction industry. Microsoft-hosted YouthSpark in Schools events sharing cutting-edge technology and teaching techniques with educators training the next generation of coders and engineers, as well as providing digital literacy workshops for parents, career-transitioning professionals and other adults. AT&T’s sponsorship of workshops on job-seeking skills to prepare Complete Communities residents for upcoming job fairs. AT&T also provided access to hiring managers who could fill jobs on the spot. The national Cities for Financial Empowerment Fund’s selected Houston to receive grant to establish a Financial Empowerment Center that offers professional, one-on-one financial counseling as a free public service. With funding from Wells Fargo, a single-family home development in Acres Home, a micro-lending program in Gulfton, college student internship stipends and renovation planning for the East End YMCA in Second Ward. Mayor Turner recently announced the creation of the Office of Complete Communities and named Shannon Buggs as director. Her position is funded by Houston Endowment. For more information on the Complete Communities initiative or to view each community Action Plan, visit online at http://www.houstontx.gov/completecommunities/. To contact the Mayor’s Office of Complete Communities, call 832-393-1085.